Abstract. In an interview to say that today in our country, a dictatorship of the law. That – state of war, in which we live. Of our citizens killed, explode. The author cites last year's terrorist attacks in the Moscow subway, and the current explosion in Domodedovo airport. In fact, there is a war. And in war must be like during the war. Oganesyan Sergey Sajadovich, doctor of pedagogical sciences, professor, state adviser of the Russian Federation of 1 class, a member of advisory council of Committee on affairs of public associations and religious organisations the State Duma of the Russian Federation, full member of Academy humanitarian researches. Key words: Torah, New Testament, the Koran, legislative activities, legislative initiatives, consistent transfer of legislative functions of humanity, the scriptures and the present, the transition from canon law to civil (secular). Abstract. Comparatively, a comparative analysis of the Torah, the New Testament and the Koran as the three epistles from God allows us to trace, as with the development of intellectual and mental qualities of people, God not only showed great tolerance to their worldview, but also gradually transferred to the people themselves functions of the legislative initiatives and legislation. The existence of a variety of legal systems and standard-setting activities of modern coutries, not only does not contradict the spirit of these Scriptures, but is predetermined by them. Pimenova Oxana Igorieva, Leading adviser of the Secretariat of the Head of Staff of the Federation Council of the Russian Federation, PHD in law, Class III Chief State Councilor. Key words: federalism, law-making process, subjects of the federation, authorities, joint jurisdiction, procedure of reconciliation, subsidiarity, coordination, joint legislative initiative. Abstract. In the article, the author attempts to examine federalism as a principle of interaction between federal and regional government bodies in the context of the organization and fulfillment of law-making activities. The author also analyses some (the most important from her point of view) methodological and practical aspects of implementation of the federalism concept in the law-making process of the Russian Federation. Abstract. The article examines attributes that characterize noncommercial organizations as elements of civil society. Also revealed the economic importance of civil society and the principles of effective operation of its structures to market conditions; analyzed foreign experience of legal regulation of noncommercial organizations; studied the positive experience of local organizations to create an adequate regime for their activities. As a result, identified the objective factors, which should be considered in the further development of civil legislation on noncommercial organizations. 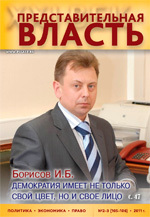 Gennady Petrovich Voronin – President of the All-Russian Quality Organization, Chairman of Committee on Quality of Products of the RF Chamber of Trade and Commerce, Doctor of Technology, Doctor of Economics, Professor; Komarov G.A.,Professor of Public Health and Health Training Institute FMBA. Abstract. The author tells how in the State Duma has passed its exhibition. The exposition included 59 samples. His observations of nature have caused such interest. This means that in our country many people are not indifferent to the lives of wild animals and all the problems of the ecosystem. Love of nature, to the animal world passed on to visitors exhibition. This exhibition was the first experience of public presentation. Thanks to the supportive reaction of the audience and the support of friends, the author appeared "courage" to continue to do the rest. Cherny V.V., Ph.D., Dr.Sci., Prof., Foundation for the protection of the constitutional rights if indigenous people of Russia, vice-president; Alibekov M.G.,Ph.D. student of the Diplomatic Academy, Moscow. Abstract. We study the problem of formation of combating international terrorism. Stressing the complexity of the problem, the authors come to the conclusion that the necessary measures to counter terrorism within Russia and in the formation of an effective international coalition against terrorism. Abstract. The article is devoted to problems of organization of modern electoral procedures and their conformity to the conventional democratic standards of the organization of elections. It analyzes organization and carrying out of national elections in Uganda on February, 18th, 2011, which were held easily enough against the background of public unrests and riots in the North Africa and the Middle East. The author wants a reader to come to the conclusion that each modern civilized state possesses sovereign rights when organizing elections (the electoral sovereignty), and electoral procedures should correspond to expectations of voters. In this case, on conditions that there is no external influence, a state will be secured against various Velvet Revolutions – Chestnut, Tulip, Banana, Orange Revolutions etc. Abstract. The self-determination and territorial article examines the state of the political institutions of modern Russia. Seeks to identify the most pressing and complex problems of the system, hindering the development of all spheres of Russian society. Substantiates the need for reform in the context of globalization. Based on the system developed by the author VMPI offered basic directions (vectors) of modernization of political institutions. Pliev S.M., the Department of Comparative Political Studies Peoples’ Friendship University of Russia. Key words: State, conflict, South Ossetia, Georgia, interaction, self-determination, policy, principle, international law. Abstract. The article examines the principles of international law (the principle of national self-determination and the principle of state integrity) and their artificial conflict, as the main cause of ethnic and nationalist conflicts. On the example of Georgian-Ossetian conflict. Sulumov R.A., the Department of Comparative Political Studies Peoples’ Friendship University of Russia. ey words: Young people, politics, government, society, the crisis, Russia, extremism. Abstract. The article examines the contemporary situation of youth policy in Russia. We consider the pros and cons of modern youth policy. Analysis of state youth policy of Russia.